Most of the business is transforming into digital and customers are also becoming digital customers. Every person is engaging in digital activities, these transformations help business persons to drive their business to the next level. Using social media and mobile apps customers can access the products/services which they want and get more information about the same. Most of the customers are using mobile apps for shopping so every retail industry should develop their own app with the help of mobile app development companies. Augmented technology is gaining a lot of attention in every sector. Now the AR technology has the high market because it has many applications in every industry to expand their business and to get more profit. With the advanced AR technology, retails can give a unique experience to their customers and helps to enhance their brand. Using mobile app retailers are making the customer experience reality along with the smartphones. These apparel store owners create an AR experience with the promotional postcards and with window display in stores, for this shopper need to open the application and scan, then the app will automatically fetch all the details about the product like color variant, pricing of that product and customer reviews and feedback about the product. 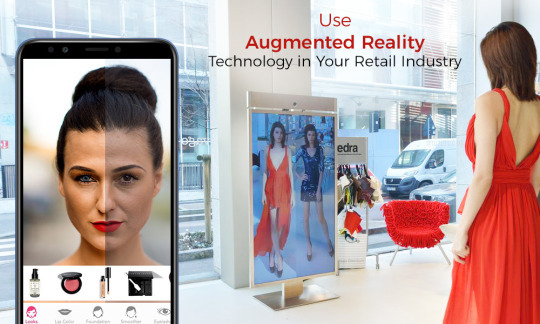 retailers can install AR embedded mirrors in their shop to display the available products for the customer just by sitting in front of the mirror. The mirror uses AR technology to display the products as the customer wearing that product by scanning the image of the customer. This is another way of implementing AR technology in the retail industry. AR mirrors are also used as the virtual fitting room, these mirrors create the virtual fitting room where customers can try a number of products without physically wearing and customers can easily select the products without any confusion about their look as well as without wasting time for trial. Home appliances products store uses this AR technology very well because no one uses to purchase a product by going to shop rather they can experience the look of a product how it is suited to their homes. Therefore AR has effectively brought in the field of home appliances, especially in the furniture industry. AR technologies are effectively used in the cosmetic industry. In this shoppers can upload their image and can virtually put makeup on it and choose the best one which suits them. It shows their makeup as real-life experience and allows users to use various products to create their best looks with trying of different cosmetic products. Some retail uses this AR technology to attract kids like using in a toy store by creating digital playground through an app and used in a kid drawing book so that children would color on paper, and that paper drawing will look like real. This makes some unique user experience feature of AR technology. At FuGenX Technologies, our team of experts helps augment your businesses by providing AR based solutions according to your niche market. FuGenX is a leading mobile apps development company UAE, provides the best service for your business.